Thomas Jefferson was the third President of the United States of America. Thomas Jefferson was born in Goochland (later Albemarle) County, Virginia, in 1743. In 1760, he enrolled at the College of William and Mary in Williamsburg, Virginia. After graduation, he studied law and passed the Virginia bar exam. He worked as both a lawyer and a farmer and lived near Charlottesville, Virginia at his plantation called Monticello. He also pursued a political career and served in the House of Burgesses, the lower chamber of Virginia's legislature. Jefferson became a committed patriot and played an important role in the American Revolution. He represented Virginia in both the First and Second Continental Congresses. The members of the Second Continental Congress selected Jefferson to write the Declaration of Independence. The document consisted of two parts. Listed first were a number of rights that the Congress felt that English colonists deserved. The second part of the Declaration was a description of the numerous ways that England had denied these rights to its colonists. The Congress formally adopted the Declaration of Independence on July 4, 1776, although several battles in the Revolutionary War had occurred over the previous year. In September 1776, Jefferson participated in Virginia's constitutional convention. His most important contribution was the establishment of religious freedom and the separation of church and state in Virginia. In 1779, the voters of Virginia elected Jefferson governor. The British attacked Richmond, Virginia's capital, in 1781 and forced the governor and legislature to flee. Shortly thereafter, Jefferson resigned as governor and encouraged Virginia to elect someone with military experience to the position. He retired to Monticello but within two years, he returned to politics and government. In 1783, Virginia selected Jefferson to represent the state in the Confederation Congress. The next year, Jefferson wrote the text of the Ordinance of 1784. This act called for the land north of the Ohio River, west of the Appalachian Mountains, and east of the Mississippi River to be divided into ten separate states. The states would first be territories. They would remain territories until they had the same population as the least populous state in America. At that point, the territories would become states with the same rights as the original thirteen states. The Ordinance of 1784 also guaranteed self-government to the residents of the territories. In 1784, the Congress appointed Jefferson as its ambassador to France. The French government had been America's most important ally during the American Revolution. Jefferson became a supporter of Louis XVI's overthrow and remained committed to the French Revolution in spite of the violence that followed. Although he was absent from America from 1784 until 1789, Jefferson also made known his opinions about the United States Constitution and the subsequent Bill of Rights. Jefferson returned home in 1789 and President George Washington selected him to become Secretary of State. Jefferson became a strong advocate for a weak central government and an economy based on agriculture. The beliefs of Jefferson and several of his friends and associates led to the creation of the Democratic-Republican Party. 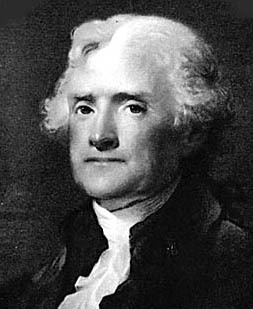 The Secretary of the Treasury, Alexander Hamilton, favored a strong federal government and an industrialized economy similar to that of England. The views of Hamilton and his friends about the United States resulted in the Federalist Party. These two parties dominated political thought for the next thirty years. Washington tended to support Hamilton. In 1793, Jefferson resigned as Secretary of State and returned to Monticello. In 1796, Jefferson ran against John Adams for the presidency. Jefferson lost his bid for president but became vice president. In 1800, Jefferson ran for the presidency again and won the election. Jefferson took office on March 4, 1801, the first president to be inaugurated in Washington, DC. As president, Jefferson's major accomplishment was the Louisiana Purchase in 1803. Jefferson roughly doubled the size of the United States by buying the Louisiana Territory from France for fifteen million dollars. The Louisiana Purchase extended westward from the Mississippi River to the Rocky Mountains and northward from the Gulf of Mexico to Canada. Jefferson also was president when Ohio became the seventeenth state in the United States in 1803. Jefferson was a strong supporter of Ohio statehood and removed Arthur St. Clair, the Federalist-leaning governor of the Northwest Territory, in 1802, to help speed Ohio's admittance to the Union. In 1808, Jefferson refused to seek a third term as president. He retired to Monticello in 1809. Jefferson helped reestablish the Library of Congress in 1815 by donating his 6,500-volume book collection to the effort. The British had destroyed the original Library of Congress during the War of 1812. He was also one of the founders of the University of Virginia. He died on July 4, 1826, on the fiftieth anniversary of the signing of the Declaration of Independence.